For the third week in a row I feel like way too much is going on and literally nothing happened. So today we are going to play a game: Do I care? What happened:Jon Snow is alive! Melisandre wants him to give her back her faith by telling her about the afterlife but he remembers only nothingness in between Olly stabbing him in the heart and waking up on the table un-dead (but not undead). Poor Jon is having an entirely relatable existential crisis. After the initial shock Davos jumps right back into Pep Talk Mode – he is for sure the best cheerleader in Westeros – and urges Jon to get back to failing if it means trying. Also living. Jon takes the time to hug it out with both Tormund and Edd before turning to meting punishment. Jon hangs Thorne, Olly, and two randos before handing his cloak and title to Edd and turning his back on the Watch for good. Do I care:Yes. I sometimes feel tricked into it but I like Jon Snow, especially surrounded by an army of wildlings (RIP Ygritte, never over it). What happens:Gilly is excited to see Old Town but nah women aren’t allowed there so she and little Sam are being sent to big Sam’s family. He explains his dad’s awful but his mum and sister will take care of her while he studies to be a maester so he can help Jon. Oh Sam, Jon died and returned before he heard anything about it. Gilly doesn’t like this plan but she trusts Sam. Who cares:GRRM has called Sam his self-insert character so I guess him? People who think vomit is entertaining? Do I care:Not even a little. And I had to look away three times during the scene. What happens:Bran watches Ned go to battle for his sister alongside Meera’s dad. They’re fighting two Targaryen guards, one the best swordfighter in all the land, who shows the title is earned. The fight unfolds differently than Bran was told as a child, with Papa Reed stabbing the Targaryen guard in the back. Then a woman screams and Ned runs off toward the tower, Bran follows and calls to Ned who turns as if he hears him. Yoda aka the Three Eyed Raven pulls them out of the vision and Bran has a textbook Skywalker rant. Bran doesn’t care if he gets lost in the dreamworld, it’s better than getting stuck in Dagobah, but Yoda tells him, again, he willget to leave. But not until he completes his training. Do I care:Not really. I’m happy Bran is back but I don’t like being pulled in and out of the visions any more than he does. What happens:Varys pays off the prostitute who helped the Sons of Harpies attack Daenerys and her protectors and discovers they’re being funded by the slaver cities Dany tried to shut down (which seems obvious once uncovered). Greyworm and Missandei want to attack the cities but Tyrion thinks it’s a bad idea to leave Mereen unguarded. He seems to have an alternative plan but we don’t get to know it yet. I hope it involves dragons cuz the bit with Tyrion’s failed small talk with Grey Worm and Missandei seemed to take 4 years and fell really flat. Do I care: No. 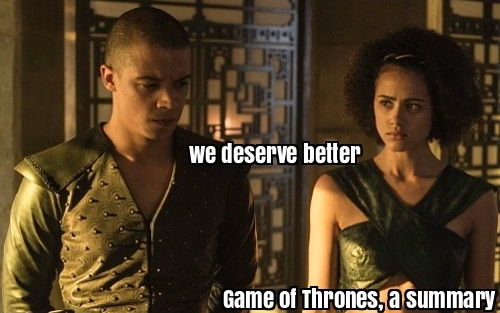 Because Greyworm and Missandei didn’t get to actually say anything. Missandei does get one fierce moment and it was definitely the strongest part of the sequence but it wasn’t anything new. Misandei is a boss who should be crowned and Greyworm is an adorable puppy who will kill you but all we ever hear about from them is their terrible lives as slaves. The scene with Tyrion was so bad because it implied that’s all they CAN talk about and that is GROSS. What happens:Qyburn is taking over Varys’ little birds and cultivating his own and Cersei wants birds everywhere so she knows who all she needs to murder once her laser eyes grow in. Jaime suggests her Mountain kill the High Sparrow but she says he’s too well protected by hundreds of hyenas and if they’re patient he’ll only need to kill one, in trial by combat. Jaime says he’s looking forward to it indicating they are doomed. The wonder twins then attempt to crash the Small Council meeting but Kevan Lannister is over it and exits the scene, taking the meeting with him. Kevan has zero f*cks and the twins have zero power. The Lannisters are eating themselves and the Tyrells are enjoying it. Do I care:I’m kind of a Lannister stan but eh. What happens:Meanwhile Tommen also tries to throw his weight around and it goes even more poorly because he’s drawn into a conversation about the gods speaking through people. Tommen is a dolt, and also desperate for affection, so he swallows the High Hyena’s tale of the Mother Goddess speaking through Tommen’s Mother by way of a Mother’s Love hook, line and sinker. What happens:Dany is handed over to her temple-prison. She tries to throw her titles around but gets nowhere and we’re informed there is to be some kind of trial wherein the Khals will decide her fate in committee. If she’s lucky she gets to stay in the temple-prison with the rest of the widowed Khaleesi. Do I care:This scene was a sometimes direct rehash of her last one, please get on with it. What happens:Arya gets beat up by the Waif while detailing her life history. It’s a kind of training montage that also includes her learning to recognize spices by smell (I guess?) and ends with her finally blocking the Waif’s blow to great fanfare (literally). Not Jaquen gives her a drink from the magic well. Arya remembers it as being poison but NJ implies it’s her final exam and I guess she nails it cuz she gets her eyes back. Do I care:I actively dislike this endless storyline. 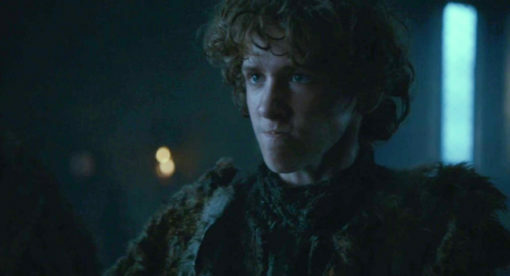 Rickon! OMG Rickon! I got so excitedto see the kid. And Tonks, of course. Ramsay is intrigued but asks “How do I know this is Rickon Stark?” Fair, since the kid hasn’t been seen in years and is supposed to be dead. So Umber brings in Shaggydog’s severed head. DAMN YOU UMBER. Do I care: Hell yes. I hope we get the Jon Snow & the Wildlings versus Team Bolton fight they’re broadcasting. I am 1000% ready for the Starks to take back the North.